I’m not sure VNF can learn much from C&RT apart from how to increase their income from boaters! Concerning the mooring situation, particularly for our larger vessels, this is a subject that was taken up with VNF Nationally by Guy Toye in past years. We now have a growing band of volunteers (still more needed please) who are attending local VNF user group meetings. One such is being held in Toulouse (Direction Territoriale Sud-Ouest) and David Rothery is representing DBA there. 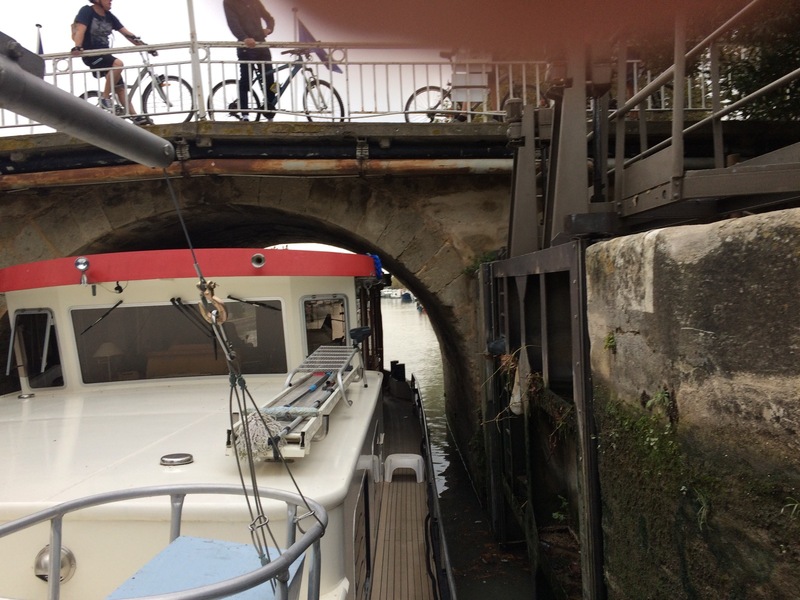 David and Evelyn have done a lot of research on moorings along the Canal du Midi and will be incorporating this work into the Waterways Guide. Having seen the detail D & E go into with their cruising notes - thanks to David sending me a suggestion as to where we might moor La Chouette, later today, in Meppel - I am confident this will be of great help to members. By reading of this thread I would expect David to raise the various issues mentioned at the CLU (user group meeting) he is going to. One problem I recall from when we were down south is a ‘new broom’ at the helm of the DT sweeping away the mooring possibilities of some places. The one that comes immediately to mind is the excellent mooring at Meilhan where we over-wintered La Chouette in 2011 and 2012. Since it is an halte nautique and not a port de pleasance the new broom stopped this facility with a stroke of his pen. Sad!!! If there are any other issues members wish David to raise at tomorrow's meeting please post here, send me an email or PM David. How lucky you are to be in a nice spot, beached level! I suspect, having explored the devastation that has resulted from the tragedy in Trèbes, that it might be rather later than next spring when you can get through to Carcassonne. The problem in Trèbes town (above the locks) was I think not totally due to the Aude flooding, but largely due to flood waters from the tributary L’Orbiel entering the canal, both by overtopping the canal aqueduct and from the canal feeder stream, both just west of the town. I suspect that little short of a major canal bank reinforcement project and a proper water management scheme through Trèbes (above the locks) will (or should) convince the Maire to allow the canal to be re-watered sufficient for navigation through the town, and UNESCO considerations might be a factor there. I do have four hefty pins but hardly ever use them unless we are on a wide deep river where there is less pull on the barge due to water displacement. The one place along here that I might have done so is on the river Herault near Agde, sadly it is now also full of long term moorers. I will be interested to see how the Garonne is, provided we can get that far in the spring after the damage in the recent flooding. It all serves to make life aboard interesting and still pleasurable though, having been unable to make it to Castelnaudary for the winter due to the flooding we now find ourselves in a drought at Homps !! Interesting to read Peter's comparison to the Midi of 8 years ago. We spent three years down there 2015-2017 and found plenty of solid and well spaced wooden posts at regular intervals all along the Midi (mainly where tree cutting has taken place) and never had to use our pins - the speed of passing boats does make this impractical. Nor did we find it a problem calling ahead and getting a mooring in a port for when we needed water and electric (about once a week). Having spent the last year on the Thames I can vouch for the fact that any kind of mooring is a lot scarcer here and pins are regularly needed, nor is it that easy to stop into a marina for a boost of power (although water is provided free at some locks and there are some pay-for Environment Agency power points too). We came across quite a few 'moving' live-aboards during our time in the south (some on small ex Norfolk Broads cruisers, some Dutch cruisers, some English barges) but with most of the bigger live-aboards fairly static in port or on VNF bankside moorings (although some of the bigger boats would winter in port and then go and moor up on a free mooring nearby and sit there all summer ). There were signs though that moorings previously available near towns for visitors were being 'rented' to permanent moorers - and sometimes this was the local mairie rather than VNF in smaller villages. I can't see that VNF have anything to learn from CRT other than if something looks like being in demand then generally you can charge more for it. I think it is called making the most of your assets! here they call the "le boats", "bateaux boem-boem" ..
when I approached the very narrow entrance of the "canal du midi" we were shocked at what we saw, a dirt, very poorly maintained "canal" with rusty and sunken wrecks everywhere, now in most places bare, without trees, "Canal du midi" does not have any charm here. there are no facilities at all and the mooring are very rare, it is expensive here and the sasseniers are rude and totally uninterested in the work they have to do, do not ask them any questions, their answer is solid "I do not know ..."
I can not go further with my boat than Beziers, and have just a chance to get a ‘mooring’ without water or electricity, it costs me 1700 € per year, you even have to pay extra to their mooring posts !! and our boat is "only 18M", larger boats above 20M are very clearly NOT WELCOME (annymore)! But, yesterday it was 18° here, today 40-50mm Rain , that is al lot of water! -tip, for your own safety it is best not to sail yourself during the high season here. I love water, but I don’t drink it..
We are down on the Canal du Midi again after an eight year gap and have noticed a considerable increase in 'Liveaboards' and 'Long term Moorers' all along here so far. Not so much large ex commercials and not just near the big cities, but smaller craft of all descriptions. Large areas each side of many towns have been allocated to long term mooring with substantial wooden posts provided. Any remaining moorings suitable for barges our size are often restricted to hotel barges and passenger vessels. My impression of it is that the VNF are offering up these moorings at a price in order to help fund the considerable amount of work involved in replacing the trees, which is still ongoing. 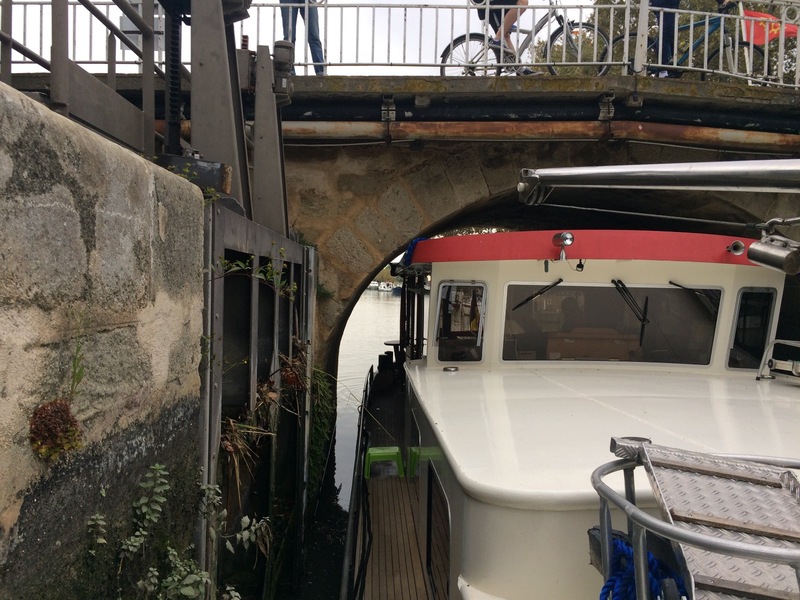 For the most part there are no electrics or water points provided at these extra moorings as yet and they are placed close to the centre of the towns surrounding what small spaces are left to cater for the hire boat trade. These are the areas where we were once able to moor without the need for water or electrics, where the bankside is suitable for us and where we could walk into the towns and enjoy a meal or a look round. The VNF need to be made more aware of the fact that barges such as ours cannot moor properly and safely on mooring spikes. Smaller boats going past at speed (as they often do) move us around and dislodge mooring spikes no matter how substantial they are, causing damage to the bankside and making it difficult for us to leave the barge with no one aboard. As nice as The Midi and The Garonne are, I doubt we'll ever come back again once we leave the south, the problems detailed above coupled with the inevitable 'Bumper Boats' have made it a much less enjoyable experience. I can cope with the 'Bumper Boats' even though they are as bad as ever, because they often provide visual amusement and for the most part are completely ignorant of the problems they cause. The thing is CRT talk about overcrowding yet the end goal with CRT is all about MONEY so overcrowding is a smokescreen to introduce more draconian rules and potential a surcharge (kerching) for being in London. Yes the waterways are busy as lots of people want to be here and cruise however the majority do move in accordance with the rules and if CRT had the balls to do something about those who take the Michael in a quick enough/succinct way then it wouldn't be so much of a problem as people wouldn't/couldn't park up for three months or more knowing the wheels are slow and they can get away with it if they wish to. Very few from the brass polishing brigade would have ever ventured into London if it hadn't been for the volume of cruisers making the waterways a little safer through the volume of boats that people so kindly refer to as constant moorers. No idea about France, as I didn't experience it as an issue other than around main towns like Toulouse and Lyon where I assumed they were all on legit moorings anyway as most looked like not moved in quite a long time and were well settled. VNF will use it to make licences more expensive and charge a premium for the better spots with lots of spots being restricted to bookings only. Given how big a problem this is in London and part of the K&A, and the issues it is causing which may impact beyond the most impacted areas from current C&RT consideration of the overcrowding that might lead to problems for live aboard barge owners across the network, do members think DBA should be getting involved with both UK and French navigation authorities about this? The Board will be looking afresh at representation and what the association's targets are shortly so thoughts on this (and any other targets) welcome. There will be a full discussion on all the topics, by the way! From observation, generally the situation in the UK is very different to in France. Where there are a few live aboards, scattered around the system, with some cities such as Lyon attracting a few. Paris, is on it's own, with miles of liveaboards. There are a few other places where a dozen or so (generally) 38's are tied, such as (along the river) at Saint Jean de Losne, at Cambrai, then around 40 at Douai, a few on the Scarpe, a few scattered around the Midi etc. Generally these places are with the blessing of VNF, (Ducs dAlbes etc.) with electricity and water supplies. Then an odd few at places such the ports such as of SJdL, Auxonne, Auxarre, Macon, Pont de Vaux, Core , Nancy etc. These people tend to "winter over" in port, and "navigate" or cruise for several months in the summer. Over crowded I would say is not necessarily the correct terminology. It seems to me, as very often happens, people in power look at the capital cities and think that it is a picture of the country. I would have though time spent on looking at the lack of moorings for 15m+ barges would be better spent. The Rhone comes to mind, but there are many villages and towns around the system where there is no facility for 15m+. We just had a mail from the UK Waterways World news editor saying that VNF has commissioned an academic to study how CRT is tackling overcrowding on liveaboard sites, especially in London, with a view to VNF tackling its own liveaboard overcrowding problems. He comments "this is another area where the UK's expertise is being consulted by the French - amazing!" There are obviously ever increasing numbers of people living aboard in France now, but I was not aware that VNF regard it as a problem. It obviously is on London's waterways and parts of the Kennet & Avon Canal, but I don't know that CRT are very adept at dealing with the situation so I'm not sure what VNF might take away from the study.